So we were just in Tuscany celebrating 20 years of marriage. We ate and drank our way through the countryside very happily finding tasty gems on each and every menu to bring back to you, my v:gourmet followers. First and foremost – not to be underestimated for its authenticity, simplicity, and pervasiveness throughout Tuscany – is Pici all’Aglione. 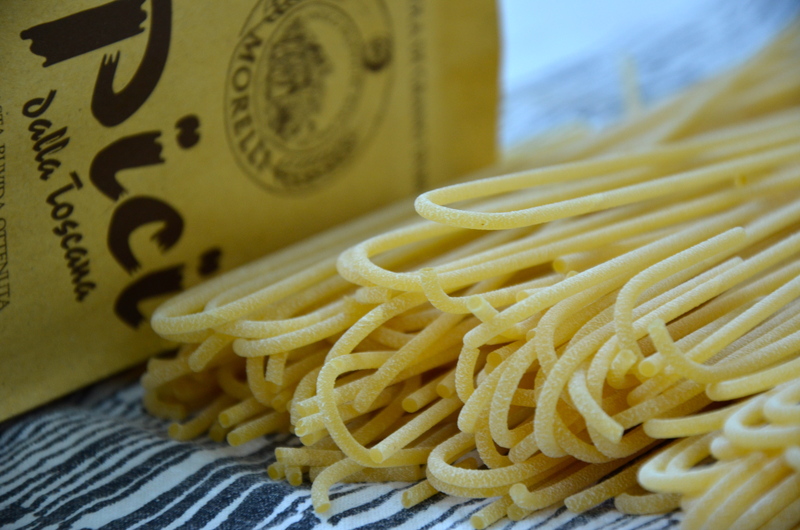 Pici is a thick, hand rolled pasta, like a fat, uneven spaghetti, originating in the province of Siena. You can find it in almost any osteria, trattoria, or ristorante and it’s usually adorned with basic ingredients like breadcrumbs (briciole), spicy garlic sauce (aglione) or mushrooms (boscaiola). Look for pici in specialty shops, or if you can’t find it, make your own. It’s hand-rolled which has got to be fun! Bring a large pot of salted water to boil. Once it’s hit a rolling boil, reduce heat and add the pici. Cook until al dente. Meanwhile, heat olive oil in a heavy bottom skillet over medium heat. Add garlic and cook until the garlic becomes fragrant but don’t let it brown. Add breadcrumbs and saute for 2 or 3 minutes. Add peperoncino or red pepper flakes to your desired heat (I put red pepper flakes in a pepper grinder and just add 2 or 3 good turns). 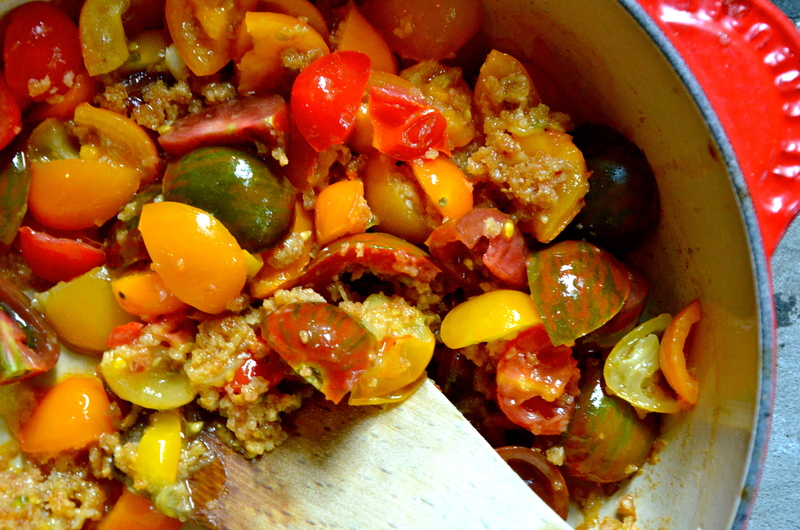 Add chopped tomatoes, sea salt and pepper to taste, and let simmer until the sauce melds and reduces slightly. Toss cooked pici with the spicy garlic sauce and watch it disappear. I made a motherload the other day for the kids, with the hope I would have leftovers, but alas the bowl was licked clean.